If you're going camping, you're going to need a tent. But which one should you get? 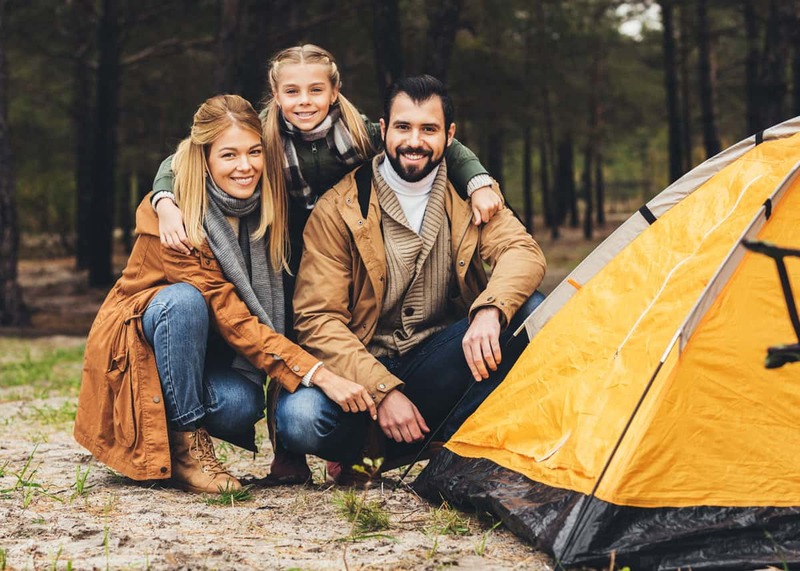 In this ultimate guide to the best family camping tents, we sorted through 100+ tents (many were awful) to find these 13 great options that we feel are the best options for families. How exciting, you’re going camping! Whether it’s your first time out in the wilds with the family or you’re an old hat, getting a great family tent is exciting. No matter if it’s a new one, a replacement or an upgrade because the family has grown, there are hundreds of choices. So, how do you choose the perfect tent for your family? When it comes to choosing the best tent, we’ve got you covered. We’ll walk you through all the things you need to consider when purchasing a great tent for your family. To start you off, we’ve included our Top 3 Picks. The best value which is adaptable to just about anywhere, the premium which is a little more luxurious, and the specialty which isn't for everyone but is the most unique of them all. If you are traveling as a couple, choose the 4 person size. If your family includes 3 or more people (including pets) the 8 person tent should do the trick. The tent footprint measures 15 x 9 feet (LxW) with a 6-foot center ceiling. The tent includes a rainfly and adjustable venting system. Kodiak Canvas Deluxe (8 Person): This is the real deal. Top rated for a reason, it sleeps 8 comfortably and still feels spacious. Made of durable canvas it will last a lifetime. Yes, it’s canvas but not the heavy canvas of old. This 100% cotton duck canvas is light and breathable which means its versatility allows water vapor to escape while still managing to be watertight. It is waterproof and leak proof – keeping you and your family dry. Family Camping / Glamping Tent: I know, this one is pretty amazing. This is a 4-season, family camping yurt. And who wouldn't want to sleep in a yurt? This tent/yurt is 16.4 feet wide and 12 feet high. And can easily fit 1 queen sized bed and 2 twin beds. The sidewalls roll up to improve airflow on warm days. This even comes with a hole for your wood stove chimney! Suitable for all four seasons – including a snowy, cold winter. When pitching your tent, whether it be in the forest or on a sandy lake shore or beachfront, you will need different pegs to fasten your tent down properly. Mother Nature is glorious and full of variations so the ground at the campsite you select may not be what you thought it would be. Just take a moment to see what type of earth you are standing on because if you put a small, short tent peg into sandy ground it will slide straight back out again. What this means is that if the wind picks up, your pegs will rip straight out and your tent will blow over or blow away. This may mean you will be the one getting snickered at by fellow campers as they watch you chase a tent around the camp grounds. Or worse, you'll have to explain why you came striding out of the brush because you rolled over in the middle of the night and your tent went with you! So just remember to pack various sized pegs, and take a moment to check the kind of ground you're camping on. For every price range from budget to premium, there are great tents within your reach that will suit your family’s needs. All you have to do is ask yourself what type of camping you will be doing. For example: if you are hiking to your destination then you don’t want to be carrying the Taj Mahal of tents, it’s too heavy and a burden. You want something lightweight, durable and compact that fits into your backpack without taking up too much room. There are tents made for all specialty climates that may require a different design. For example: a lightweight tent with excellent ventilation for the heat won't cut it on a cold winter's day. Then there are others designed and made from special materials that can handle extreme temperatures like arctic conditions when the temperature drops below freezing with additional high winds. Types of tents vary from lightweight for hikers and mountain bikers, to heavy winter tents with space for a wood stove. Finding the right tent for your family and style of camping won't be too difficult. A lot of tents are versatile and can be used in many settings. Handy Tip: Always clear your tent site of rocks, pinecones and twigs. It is very hard to remove a rock from under your tent in the middle of the night so you can sleep! Don’t worry, we’ll provide some handy hints along the way to help you out and make doubly sure you look like you know what you are doing if this is your first time camping with the family. Going camping in the winter? Here are some tents that will keep you comfortable. Here's what you need to consider when purchasing – length of trip, number of people, climate (desert, forest, beach or lakefront) and how easy it is to assemble and disassemble. We will cover all these aspects and more. Length of trip: If you are just going for a weekend and it’s an overnight trip then if you forget something you can probably make do. For example, if you forget a pole for your tent rain fly then you may be able to tie it to a tree instead and make do overnight. If something goes wrong – big storm and everything gets wet – then you can simply pack up and go home earlier the next day. But, if you are going for a week or two weeks you want to ensure your tent is truly tried and tested when purchasing because sometimes you can’t just pack up and go home. Or you don’t want to. Especially, if you’ve driven hours to get to that particular camping spot or a National Park in the next state or two over. Number of people: If you are camping with say, Mom and Dad, plus two kids who each have a friend along, do you want a 6-person tent where you’re all in close quarters? Or do you want an 8 to 9-person tent that takes the same amount of time to set up but has additional room to move, and set up queen sized air mattress’. Especially if you are camping for a longer period of time this is something to really think about because you don’t want to be on top of each other all the time. That little extra room can make all the difference between a great trip and returning home in icy silence – with camping tainted forever. Climate: Now this is a biggie. A lot of tents on the market are designed well enough to withstand most temperatures, degrees of rainfall and changing weather conditions, like 3 and 4 season tents. But climate does make a difference. I mean you don’t want to take a heavy canvas tent that doesn’t breathe to a hot climate like a desert or beach and have it turn into an oven during the day? No, you want something that breathes so you can leave it open and enjoy that ocean breeze in your cool shelter away from the harsh sun. Sleeping on the ground with a bad case of sunburn is not for the faint hearted, it’s ruined more than one camping trip. Ease of assembly and disassembly: Something most people don’t even think about is the amount of time it may take to set up your campsite. Not just the tent but the whole kit and caboodle. So, if you can cut down on time setting up the biggest thing – the tent – then it gives you more time to relax and enjoy your camping environment. These days there are ‘pop up’ tents which basically erect themselves (we will discuss those later in the buyer’s guide) and then there are the old style of tent that need a little more time and extra hands to set up, so ideally what you want is something in between. Easy to assemble but also quick and easy to pull down if you want or need to leave in a hurry. Remember, in nature rainstorms can seemingly appear out of nowhere so you may need to setup camp quickly and under less than ideal conditions. Dome tents are one of the easiest tents to set up. Budget: How much do you want to spend or can you afford to spend? Now before you freak out and think you’ll have to spend a squillion dollars, there are literally thousands of great tents in every price range so take a deep breath and ask yourself this – how often will we use it … really? Are you going to be camping every second weekend for the next ten years, once every couple of months or twice a year… maybe? The amount of trips you will do and how often it is used will help you decide how much to spend. If you are planning on camping regularly, then you want a well-constructed tent that has been rigorously tested, so you know it’s durable and you don’t have to replace it often. Size: Now that you know how much you are willing to spend, how big a tent do you need? Tents these days come in every size and shape to accommodate anywhere from 2 people up to a football team in comfort. This is great because it gives you the option to buy a bigger tent than you need so the occupants have a little more room to move around and are not tripping over their bags. Or you may just want to feel like a five-star camper with more room, either way the option’s there if you want it. Just remember, the bigger the tent, the more room it takes up in the car and the heavier it will be. So, if you want the Taj Mahal of tents, that’s great, just make sure you have the space and people to carry it. Style: And lastly, which style of tent do you need? There are general tents that are all-rounders and can be used year-round in all 4 seasons, then there are specialty tents for something like handling arctic sub zero temperatures. Just take a second to dream of all the wonderful camping spots you would like to take your family. So, what’ll it be – the cool pristine beauty of Montana’s Glacier National Park, the warmer camping areas of The Grand Canyon or the diverseness of the Appalachian Trail? That’s the beauty of camping, nature's wonder is at your feet so it doesn’t matter if it is in your own state or on the opposite side of the country, just think about where you are most likely to spend your time and go from there. Your ‘most likely’ camping locations will tell you everything you need to know about the type of tent you need. But don’t worry, there are also tents designed to handle all four seasons so you can take them all over the country … just not up Mt Everest. We’ll cover these categories to help you find good choices in your price range that fulfill your family’s requirements. Now just because we say ‘budget’ don’t automatically think it’s less than par, this doesn’t mean it’s not a good tent or one that doesn't meet your needs. If you are everyday camping in normal weather conditions, sometimes you just don’t need to spend a fortune. A basic tent is all you need. I mean you’re not battling snowstorms with your family’s survival at stake. You may just be camping on a summers eve on the lakefront with clear skies and a gentle breeze, so it’s more than adequate. Most tents have similar traits but differ slightly. Think water resistant versus watertight. The difference is that under normal circumstances a tent that is more than capable of handling light rain may not stand up to a torrential downpour during an equatorial wet season. Both are built for different things and honestly, do you really want to be camping in a torrential downpour anyway? For most people, that’s a strong no. The following budget tents are good tents with good reviews that can still do the job just fine. Sleeping up to 8 people with a 6-foot-high centre, it can fit almost anyone comfortably. Fully expanding on its own which makes set up easy and less time consuming, it also compresses down to a compact size when you go home, making transport easy. Proven to stand up to the wind while retaining its shape and withstand heavy rains it keeps you dry. Additionally, a full rain fly is included for extra protection. Mesh windows and door supply adequate ventilation and temperature control so it’s perfect for a family, groups of friends or even a cub scouts trip. With great accessories like a self-inflating air pad to insulate and add that little layer of cushioning (if you’ve ever camped on uneven, bumpy or rocky ground you will appreciate this immensely) that inflates in no time, and an accompanying pillow, AmazonBasics family sized tent is a steal. Oh, the pillow’s super comfy foam filling offers great support as well as compressing when it packs up into a nice small package for easy storage. Fitting 3 queen-sized mattresses and tall enough for a six-foot person to walk around in comfortably, Core Equipment’s tent sleeps nine campers or a family of six with added room to move. A multitude of pockets keep everything easily stowed up off the floor and help the tent to remain uncluttered which is ideal if sleeping a lot of people. Additionally, a convenient lantern hook attached to the overhead gear loft means at night the whole tent can be illuminated by a lantern to avoid those annoying ‘torch in the eyes’ incidents. An electrical cord access port which you can fully close when not in use (to keep any bugs out) is handy for charging your phones or electrical devices from inside the tent. Big windows allow for good ventilation and air flow along with an adjustable ground vent to ensure plenty of fresh air flows through. Made from tough tightly woven material which helps the rain, dew and drizzle bead and slide right off. All of the extras are included with everything you need – poles, pegs and additional rain fly which have their own bags for easy pack up when your trip is over. Easy enough for one person to set up and pull down it also accommodates even the tallest family members and friends under the 8.5 foot roof. This tent is so roomy you’ll feel like you are vacationing in a cabin. Able to move and walk around with ease in every inch of both rooms under the waterproof roof you won’t have to worry when that familiar spattering of rain takes you by surprise. The floor also extends up 3 inches, providing a ‘tub like’ floor guaranteed to keep you dry if that spattering turns into a heavy downpour – with the added bonus of keeping snakes and creepy crawlies out. Big doors and windows allow excellent airflow and ventilation, and if that is not enough and you would like more airflow on those hot summers nights then that’s easy, just unzip the skylights! (found on the XL Model) so the air moves up and out keeping everyone in your tent cooler. This is a pretty unique design which is highly adaptable allowing you to mould it to suit your family’s needs by adding an extra entryway, room or storage space by just adding on rooms when needed. As your family grows you won’t have to upgrade to a bigger tent, you can just add an extra room, saving you money and increasing convenience. So as the years go by and your kids bring friends you can set them up with their own space, keeping the peace and saving time and money. Easy to keep tidy as all rooms have big storage pouches to stow away all their gear along with power cord outlets to charge all electrical items, it has multiple interior loop ties to hang towels, clothes, lanterns etc. and free up even more space while allowing things to dry or just be out of the way. What we consider a premium tent is one that is able to stand up to most situations that you may encounter while out enjoying the great outdoors. One that you can rest assured is tried, true and very well tested under the strictest conditions, with great reviews from real people who have purchased it and know it’s held up under real life situations like heavy rains and high winds. So, you can rest assured when you see those big ol' thunder clouds rolling in you and your family are able to weather it out and come out the other side unscathed and dry. After all, there’s nothing worse than all your gear getting wet and you spending the next two days making temporary clothes lines to dry everything out. These kinds of scenarios usually end in an unhappy campsite. Handy Hint: Always have additional rope or cord when camping so you can make temporary clothes lines in case of rain. Or just to dry towels after a swim. Best made from a bright highly-visible color so you don’t accidentally run into it and hurt yourself. This is the real deal. Top rated for a reason, it sleeps 8 comfortably and still feels spacious. Its tight weave means that it is waterproof and leak proof as the water just beads and runs straight off, ensuring you and your family stay dry. Made of durable canvas it will last a lifetime. Yes, it’s canvas but not the heavy canvas of old. This 100% cotton duck canvas is light and breathable which means it versatility allows water vapour to escape while still managing to be watertight. That means any moisture that may have made its way inside can get out helping to reduce the chances of mold or mildew which was a major problem with the heavy canvas of 20yrs ago. Extremely manageable, this tent is light enough for a one person set up while the center height of 6”6’ means you can move around comfortably. Once it is set up your comfort is assured with no-see-um mesh built into the two doors and four huge windows which will help keep the creepy crawlies out. It also means that there is great ventilation to help with temperature control just by opening and closing a window. Built to last, this durable and hardy tent is designed to handle everything from desert camping to the snow without a worry. Big enough to fit 2 queen-sized airbeds and still have enough room leftover to feel spacious, this is another highly rated hit from the Coleman company. It includes dividers so you can make up to three rooms for privacy for the whole family. One for the parents and one for each of the kids and their friends making it immensely popular with parents of big families and avid campers alike. With a 6 foot centre height, most people can move around comfortably without stooping, and big windows provide ample ventilation. The WeatherTec system design allows water to bead off quickly so it doesn’t have time to leak while the welded floors and inverted seams are vigorously tested and, according to all reviews do keep you bone dry even under the heaviest of rains. Easy to erect for a big tent, this means that you spend less time on setting up your campsite and more time fishing or relaxing in the great outdoors which is why your camping in the first place. Easy to disassemble and packing down to a small size means it’s easy to carry and transport in its sturdy carry bag so it can be handled by one person. The only downside is you may want to take some additional pegs with you as most big tents will want some extra staking if the winds pick up. This Browning Camping 2 room family tent makes for one luxurious home away from home by maximizing space and comfort. An extra tall 7 foot center means even basketball players could camp in this easily without having to stoop or move around hunched over inside the tent, now that’s saying something. With 6 big windows larger than most tents and a mesh roof, it provides amazing ventilation alongside an abundance of fresh air so you truly feel like you are outside… but without the mosquitos. Plus, it allows you to enjoy one of the best reasons for camping – watching the stars while you fall asleep in the security of your bed… bug free. The free-standing design is simple to set up and take down, while the fiberglass poles are easy to handle and lightweight, plus you have the added bonus of additional steel uprights to add that extra level of strength and support. It comes fully equipped with all those essentials like stakes, sturdy rain fly and tie down guy ropes. One camper reported it standing up to hail without a problem so well and truly worth the investment if hail is a frequent occurrence in your state. Boasting a 60 second set up time this tent nearly sets itself up. Core Equipment have provided a tent to enhance your camping experience by allowing you less time and gear needed to set up your campsite. So, while everyone else is busy hammering, tying and putting poles together, you can be fully set up, relaxing with a beverage and enjoying the show. But no rubbing it in, okay? Oh, it may take you 3 minutes if you decide to put up the additional room divider for privacy and an additional few minutes for the rain fly. Comfortably sleeping nine people in your choice of one or two rooms, this is another whopper with an over 7-foot center to make it feel like a real home away from home for all those really, really tall family members. An electrical cord access port is also built in to help charge phones or any other electrical device and completely closable when not in use so the critters don’t get in. Pockets are all around the tent so your gear is up off the floor preventing trip hazards and clutter. On those clear warm summer nights, it’s nice to have the option of leaving the rain fly off so you can enjoy some stargazing through the mesh roof and make the most of the ventilation it provides. Read more about essential oil bug repellent. Roomy enough for 8 people with the additional screen room out front, Wenzel made this tent so you can relax both inside and outside. Enjoy a bug free night when the sun goes down in the comfort of the mesh screened room big enough to fit table and chairs. The screen rooms overhead awning means your tent stays dry as it provides a place for you to leave your wet shoes etc. without fear that some critter may run off with them. During the day, it doubles as a sun shade offering additional protection so you can enjoy lunch in the shade and not worry about sunburn if you’re camping in a place without shaded table and chairs available. Great ventilation comes from floor to ceiling as the breeze moves through mesh ground vents, flowing up and out of the mesh roof vents for you to make the most of that fresh mountain air or sea breeze. Well-designed windows add extra weather protection as a mini fly window flap opens out and leads rain away from the windows. Covering the entire window and slanted down on an angle it ensures you stay dry inside. This design also stands up to high winds so no matter what the weather conditions outside, you are snugly tucked up inside enjoying your time in nature. What a whopper! Able to fit an entire football team plus the coach and a couple of reserves, this is the tent for any sized family who want to enjoy the great outdoors. Tahoe Gear bring you an impressive, attractive tent where you can watch the stars on a clear night and batten down the rain fly for when the clouds come rolling in. The rain fly also extends further out over the door for added protection. Built from 1200mm polyester it is durable and adaptable to almost any weather conditions. Roomy and tall enough not just in the centre but also around all walls you could be forgiven for feeling like you were in a cabin as you move easily throughout the tent. This huge tent has amazing ventilation and adds to the feeling of space when fully opened up as half of it is mesh. Without the rain fly covering the mesh roof and with all the windows open you feel like you are actually outside but without that familiar and irritating zzzz of the mosquitoes. The only downside with this tent is that it’s water resistant not waterproof so when it rains you will have to close the windows and hope it’s not a downpour. The rain fly doesn’t cover the front windows so they have to be shut and it can get a little warm inside depending on the amount of people inside the tent at the time. Great value, but it would probably be a smart idea to invest in a tarp large enough to cover this tent and take it along just in case the rain does decide to pay you a visit. Especially if you are camping for a longer period of time. Is it going to be rainy? Here's how to setup your tent in the rain. Camping is all about quality time with your family. Decompressing, leaving the fast-paced world of work behind and recharging your family’s batteries with a mini vacation, even if it’s just over the weekend. Smaller two-person tents are perfect for kids and are often cheaper, come in a bunch of fun colors and help keep the peace as they provide your adorable little balls of energy with their own space. Give your kids their own little safe place to play in, hang out or just read a book and enjoy some peaceful time. A lot of parents refer to this as a ‘sanity tool’ allowing them some additional quiet time as well making it a win-win all around. Unhappy kids can make your trip challenging and not the stress-reducing getaway you had hoped for. Happy kids make for a great trip and de-stressed parents. Here’s a great, fun little tent that’s just perfect for kids. I mean, after all, who doesn’t want a rainbow-colored tent … am I right?! The top rating is well earned by this little ripper for both construction and design. Stormproof with 2,000mm tightly interwoven waterproofing and a rain fly covering every inch, it’s guaranteed to keep you dry. The cross-wound poles add strength which also means it’s able to stand up to heavy winds with its sleek design making this great little tent perfect for the kids to hide out in. They have their own fort to play in as the wind howls outside. Taking all the worry out of camping, Chillbo Baggins (even the name is fun) is bound to be a hit in a range of bright colors for those kids that want something different and colorful. Doors front and back provide great ventilation as the no-see-um mesh keeps the critters out. The internal storage pockets help keep things from getting lost and off the floor so no-one trips or hurts a foot by standing on things. This compact tent even comes with a large storage bag so you don’t have to struggle when packing up, and you know what that means don’t you? It’s easy enough for the kids to pack it up themselves. As an added bonus, it’s so easy to set up and pull down the fun can continue when you get home on weekends by camping in your backyard. Handy Tip: In your tub of camping spares, amongst the rope, batteries and extra tent pegs, stash away a book of puzzles or word finders for those rainy days so the kids have something to pass the time … unless you prefer hearing “I’m bored, there’s nothing to do” for the fifteenth time in half an hour. For something truly unique Napier Enterprises have designed a camping marvel that is nearly impossible to leave behind as it fits directly onto your truck. A wet campsite is a thing of the past as you are up off the ground and comfortable, especially as it has a rain fly that covers every inch keeping you bone dry as the rain streams off onto the ground below. With a big door, it’s easy to get in and out of and the 4 large windows supply an abundance of fresh air and great ventilation. But don’t worry, your privacy is intact with a storm flap covering the door so someone wandering by can’t see in. It’s quick and easy to set up and the flexible fibreglass poles provide strength while ensuring it stands up to wind so matter where you are this is a great option to traditional tent-on-the-ground camping. Available in a range of sizes, please make sure you double check the size before you purchase because the last thing you want is to receive your newly delivered tent and then have your excitement slip away as it’s meant for a small truck and you have a F150! The only downside is that it would only fit a small family so would not be ideal for a long camping trip … or the Brady Bunch. Unless of course, you have another tent for the kids, then you won’t have a care in the world. Handy Tip: Be sure to take a small step stool to help you climb in and out of the back of the truck, because when you are half asleep you may forget and fall out. Pop-up tents are all the rage these days, so we thought it worth a mention. What is a pop-up tent? Well, it just means the tent basically sets itself up, it ‘pops up’. Reducing the time it takes to set up your campsite, these tents are becoming increasingly popular. Lightweight and compact they are ideal for those last-minute getaways when you decide to take advantage of the long summer days and take off with the family for a quick spur of the moment break. No muss, no fuss, just pull it out of the bag and watch it unfold … literally. Two doors and big windows provide great ventilation and durable seams, plus sturdy zippers add to the hardiness of this dome design. Completely private with double doors, it also has all the added extras that help make camping fun. Internal gear pockets to store your stuff and a central hang loop illuminates the entire tent while keeping your hands free so you can enjoy other activities like reading a book while enjoying a cuppa joe. The only downside is that it is only water resistant and not for use in heavy rain so maybe this one can be the one best kept for clear skies and camping closer to home. Here's something a little different from the traditional tent: a 4-season yurt bell tent. Add to your family fun by pretending you are on an African Safari or living like one of the royalty of a nomadic desert tribe. Solidly constructed central and outer poles provide support for the 3,000mm waterproof canvas double stitched walls and roof which slopes down allowing maximum water run off keeping your family dry. This yurt is big enough for an average sized family to comfortably move around in or as a central meeting place for several families camping together. You have a choice of sizes with a 3m, 4m or 5m diameter base whose heavy-duty zippers release the walls allowing you to roll them up to reveal floor to roof mesh walls. These meet with a huge front entrance which opens up the entire tent for maximum air flow and light while keeping you bug free and prevents any night time critters wiggling their way in during the evenings. It's mold resistant, and great airflow means it won’t have that musty smell if you have to close it up due to rain. Plus, the sturdy zippers also have an additional cover to help keep any moisture out and reduce the risk of mold or fungus. Tested to holding up against 30mph winds, all key points are reinforced adding extra strength to the entire structure. All guy ropes and pegs are provided but like all tents, you may want to take some extra pegs along for added support if you happen to find yourself in grade 6 winds. For those that want the whole yurt experience, it also has a chimney hole in the sidewall which funnels the smoke from your cooking stove outside. In winter, this also allows you maximum warmth as you close up and cook inside while basking in the warmth of a stove or fire. It’s designed this way because a chimney on the sloping roof may allow the possibility of rain to leak inside so they placed it on the wall. They have thought of everything! First time camper? This guide to beginner camping gear should help. And there you have it. Our choices for the best family camping tents. Not sure which one to choose? Here are our top 3 picks. With all of these options your family is bound to enjoy plenty of successful camping trips for years to come. Which one are you considering? Have a camping / tenting tip to share? Nice! Join me in the comments!